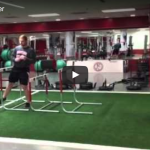 I want to start posting videos of exercises that I use with my athletes. This video is the Hurdle Over/Under. Let me know what you think. 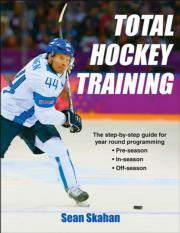 Today is the official release date of my book Total Hockey Training. I can’t believe that today is actually here. The reality is that there were several days when I thought that this wasn’t going to happen. Whether it was self-doubt or I didn’t feel that I had enough time to hit certain deadlines, the completion of this always seemed way down the road. – I didn’t trust my writing ability. I didn’t want to make an e-book that may have contained grammatical mistakes. The people at Human Kinetics take care of those things for a living. – I remember a conversation with a friend of mine back in California several years ago about internet gurus and e-books. I remember him saying “Unless a sports or strength training book is published by a reputable publisher such as Human Kinetics, I won’t pick it up.” Now, I am not saying that e-books aren’t any good or worth the read but, hearing him say that always stuck with me. I trusted Human Kinetics to help me create a solid product that I believed in. – I wanted the challenge of going through the process from start to finish. I wanted to go through this to accomplish something big. As a result, I can say that I have a huge amount of respect admiration for anyone that has written a book. 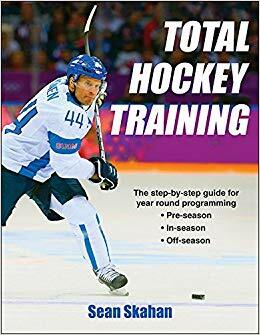 Total Hockey Training encompasses everything I’ve learned over the years training the beginner to the professional hockey player. You can get a copy at Amazon and Human Kinetics. I hope you enjoy it! Some of the best coaches to have ever walked the planet were known as coaches who emphasized the details. Details have always been emphasized by the best. No stones are left unturned when it comes to planning and organizing every aspect for their team. John Wooden, for example, was known for not only being a winner, but for spending time with his players on some of the basic tasks such as teaching them how to properly put their socks on to prevent blisters. Coach Wooden also spent most of his day planning the days practice. Every aspect of practice was planned for and organized to run the same way that Coach Wooden envisioned. The best coaches also embrace the process. It is the day to day grinding of helping their teams prepare for every little challenge that their teams may face in any situation. Great coaches also stay in the moment. It isn’t necessarily the next game or the next couple of games. It is the details of improving for the next drill at practice, or the next play or shift during a game. As I transition back to the collegiate strength and conditioning environment, I find myself planning training sessions well in advance. Not to say that I didn’t previously. However, the difference is now I have the opportunity to take entire teams through training sessions from start to finish. I try to always have a vision of how the session will flow. How much time should I dedicate to foam rolling? How long will they take to go through hurdle mobility? At what point in the session will they progress to the power racks? Etc. Everything from when they walk in the door through their last repetition of the last set of the last exercise is planned for accordingly. The longer I do this, I realize that it really is all about the process. Its trying to do the little things better over and over again on a daily basis. The better athletes that I have been fortunate enough to work with over the years always embraced this. They enjoyed the monotony of doing the little things continuously to help them succeed. Strength and Conditioning coaches should have a plan every time their athletes come through the door. They need to be prepared to help them get the next rep and/or the next set. Training sessions need to be scripted out so that nothing is left out or not prioritized- everything is important. “Today is the only day. Yesterday is gone” is a John Wooden quote that I found on the internet. Strength Coaches need to coach and help their athletes through every little aspect of their program on a daily basis. I have always been a proponent of implementing cross-ice only games at the mite level of hockey. I believe in what USA Hockey is doing through the American Developmental Model (ADM) and I am a big believer in young hockey players also being young “insert another sport here” players. Also, I believe that young kids shouldn’t subject themselves to the same rink specifications of NHL or international leagues. Although I also believe in practicing what you preach, I must admit that I am guilty of questioning whether or not cross-ice games would be good for my own son. My son started to learn how to skate when he was 3. He participated in learn to skate and hockey programs and then began playing cross ice at age 4. When he was 5, he played at the full-ice mite recreation level. The year after that, he played at the travel full-ice level. Although he played in 2 complete years of full-ice hockey, he also competed in several full-ice tournaments. While his games were played in the full-ice format, all of his practices consisted of drills and games done in small areas. Practices were done twice per week and they always followed the ADM principles. At the time, I though the progression was fine. My son is a little bigger than most of the other kids his age and I would consider him to be average to above average in skill and skating. To him, it seemed like full-ice hockey wasn’t a big deal. After his first year of travel hockey, we found out what was going to take place this season- one half of his games the season are going to be played in the cross-ice format, and one half of the season is going to be the full-ice format. This is taking place because USA Hockey is mandating that mite level hockey is all cross-ice. However, there is a transition period going from full-ice hockey to cross-ice hockey so kids in my son’s age group who have played full ice don’t have to make such a drastic transition. For my son, the reality is that because of his birth year, he must participate in this. If he was a year older, he would be eligible to play up to the next level. For him, I don’t necessarily think it’s a bad thing and most importantly, he could care less. – One minute and 30 second shifts which were controlled by the sound of a buzzer- This was great. Equal ice time for everyone and both teams changed at the same time. Brilliant. – No off-sides calls- I do like this even though the kids aren’t learning the off-sides rule. – Kids seemed much more confident with the puck- Don’t know if it was because of playing against a weaker team or not, but was still good. – Lots of goals were scored and there were face-offs immediately after each goal. Retrieving the puck and conducting a face-off is time consuming. I like the pick-up hockey format where the team that gets scored on plays the puck out of their net. This would allow play to keep moving. If the score isn’t being kept, then who cares? – Growing pains are going to happen. There were many times when it seemed like the facility was trying to figure it out while it was going on. For example, some referees didn’t know some of the rules and the locker room situation was crammed. I guess if you have 4 teams playing on the ice at once, you will need more locker room space. All in all, I think this is going to be great. There are lots of concerns from parents about possibly delaying their sons/daughters development. However, when I offer my opinion on this, I tell them to think long term. Don’t worry about their child being the best mite but rather think about him being the best bantam or midget. When I think about my own son, I think he will benefit from this. Since he is already a little bigger than most of the kids, he will learn how to handle the puck in small areas under pressure from the smaller and quicker players. When I think about how much more time that he will have the puck on his stick versus times in a full-ice situation, it is a no-brainer. Also, I don’t think 4 months out of their hockey development where they are put in competitive situations that suits their abilities is going to hurt them. It can only make them better- especially when they return to full ice competition.